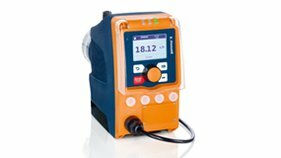 The new solenoid diaphragm metering pump gamma/ X is user-friendly and has an outstandingly long service life, just like its predecessor. An ingenious solenoid control measures the back pressure and protects the system from overload. This technology makes a pressure sensor superfluous, meaning that operating safety can be significantly increased: no additional parts come into contact with the feed chemical, there are no additional sealing surfaces and no electronic components come into contact with the feed chemical. Whether the metering volume fluctuates or hydraulic failures affect the metering process – the gamma/ X keeps everything at your fingertips. It independently ensures a trouble-free metering process and, should the pump ever need maintenance, its service module draws attention to this.